The people of Sodom and Gomorrah are extremely sinful against the Lord. The cries against the sins of Sodom and Gomorrah to God is so great that God decided to come down and see if this is true. While the Lord was heading towards Sodom and Gomorrah, Abraham stood still before the Lord. Abraham bargained with the Lord to spare the lives of the righteous men who lives in the city. When the two angels of God enter the city of Sodom, Lot who was sitting at the entrance gate stood up to greet them. Lot welcomed the two angels into his home and asked if he could wash their feet. The two angels refused to spend the night at Lot’s home but Lot insisted. Lot made a feast and the two angels sat down and eat with them. Before they went to bed, all the inhabitants of the city had surrounded Lot’s home. They demanded that Lot bring the two men out so they could lay with them. Lot wanted to exchange his daughter in return for the two men but the villagers refused. They pressured Lot and was about to break the door when the two men came out and pull Lot into the house. Lot felt that he couldn’t make it to the mountains and begged the angels to spare his lives so that he can make his escape to the nearest city. The city is called Zoar. While making their escape to the small town, Lot’s wife looked back and she became a pillar of salt. 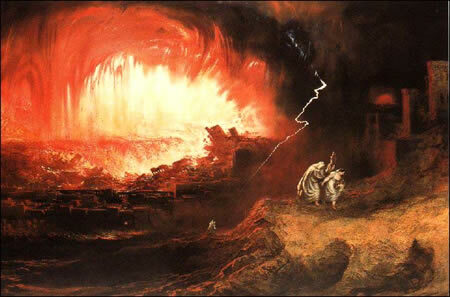 After Lot arrived safely at Zoar with his two daughters, God rained down brimstone and fire on Sodom and Gomorrah. Early in the morning, Abraham woke up and he looked down to the cities of Sodom and Gomorrah. Abraham saw that everything was burnt down and there was a smoke of the furnace that went up from the cities.